Chop the tip and the tail off of the spaghetti squash, and stand the squash up-right on a cutting board. Carefully cut the squash in half length-wise - gravity will help you chop from top to bottom. Use a spoon to scoop the seeds out of each of the halves. Rub about a tablespoon of olive oil over the flesh of each half. Sprinkle generously with salt and pepper. Place both halves cut-side down on a baking sheet. Roast the squash for 45 to 50 minutes or until the flesh is tender. Remove from oven and allow squash to cool about 10 minutes. When the squash is cool enough to handle, use a fork to gently scrape the flesh, releasing spaghetti-like stands. Do this until both halves of the spaghetti squash are scraped clean and place the “spaghetti” into a large serving bowl and set aside. Add all ingredients for the pesto sauce to a small blender (or food processor) and blend until it reaches desired consistency. I blended mine until smooth. In a large skillet, heat the oil to medium. Carefully place the shrimp on the hot skillet, and add the garlic. Allow shrimp to cook until it begins to plump and turn pink, about 1 to 2 minutes. Flip shrimp to the other side and allow it to cook an additional 1 to 2 minutes, or until cooked through. Lower the heat to medium-low, and add the pesto sauce and prepared spaghetti squash. Fold everything together and cook until everything is hot. 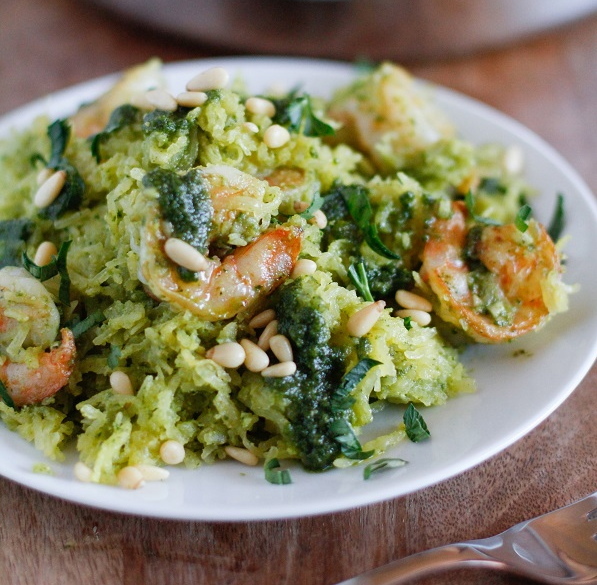 Serve heaping portions with pine nuts, fresh lemon wedges, and grated parmesan cheese. For additional recipe details, please visit the site of our generous contributor: TheRoastedRoot.